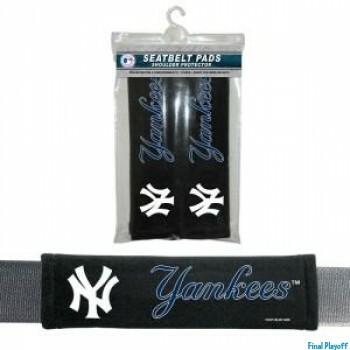 All MLB New York Yankees products ordered on final playoff are processed for shipping same business day. 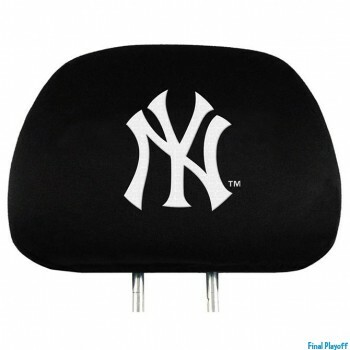 These headrest covers are officially licensed by MLB New York Yankees and manufactured by Team Promark baseball fan gear. This auto seat accessory features a cotton polyester blend to give a sporty yet comfortable look. The elegantly embroidered color stitch team logo on the front center is sure to please any fan of the game. The elasticized bottom band helps it fit virtually any size, shape, car or truck standard seats. This auto accessory comes conveniently packaged as a pair.